OZ 2V 250 .. what carby? Also, what about the linkage? I have the 2bbl Stromberg that came with it, but if I'm going to change it, I'd rather change it now. Any opinions on this? Also, does anyone know a good way to use the rod linkage I have in place, or do I have to convert to a cable? Re: OZ 2V 250 .. what carby? Also, what about the linkage? Fords US and Australian engineers spend money changing there design to suit the lowest cost carburation that gives good results. What follows is a summary of each. 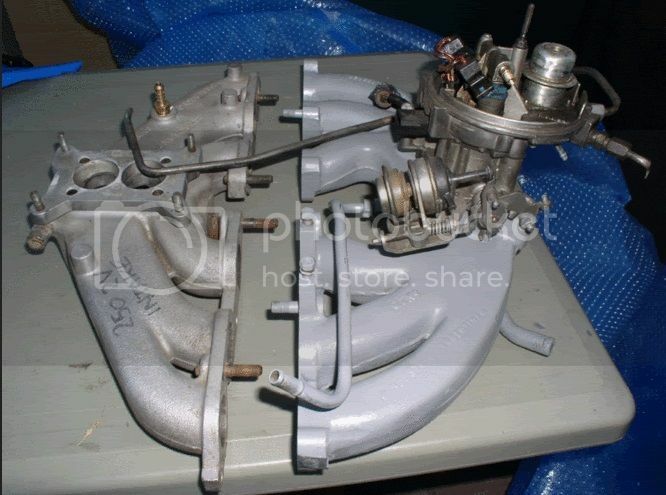 The Stromberg WW2 carb is made in Sidney, not Sydney. Ancient Pre 2300 Holley 2bbl era. Its a Bendix Technico carb. And its the cheapest, nastiest 2-bbl carb around. Cutting edge 1953 Mopar/Studebaker technology. The Holley 2210, 2245....same kinda stuff. IH used a Holley 2300 on many older 304's and 345's that was around 275-290 cfm. Later IH used the Holley 2210 on 304'a and 345's. Starting in '79 IH used the Holley 2245 on 304's. Each year it's 2-bbl carbs got less meaner, a lot greaner, leaner and cleaner. 1. Best carb for power is always a Holley 2300 2 bbl or a 4150/4160 Holley 4bbl. They aren't always the best for fuel distribution or economy right out of the box. 2. Best carbs for economy are fine atomisers like the Rochester 2-bbl Varajet, the Fiat 1600/1800/2000 based 2-bbl Weber ADM's (used in 3.3/4.1 X flows) and a couple of the Autolite 2100 and Motorcraft 2150 2-bbls. The Holley Weber 52xx/62xx/65xx in the 235 to 280 cfm range can work, the Weber 32/36 DGAV, 38 DGES, they can be as clean or economical. The advatage with any Weber DG is that there is 100% US parts back-up, and a great depth of knowledge to tune it. The 5740 Carter Weber is too small to work. Good other 4-bbls are the ancient Autolite 4100 series 4-bbls. Modern half breeds which can work are the Summit 4010 and 4011, revisions of the old Holley 1986-1989 4010/4011 carbs that almost took Holley out in the late 80's. 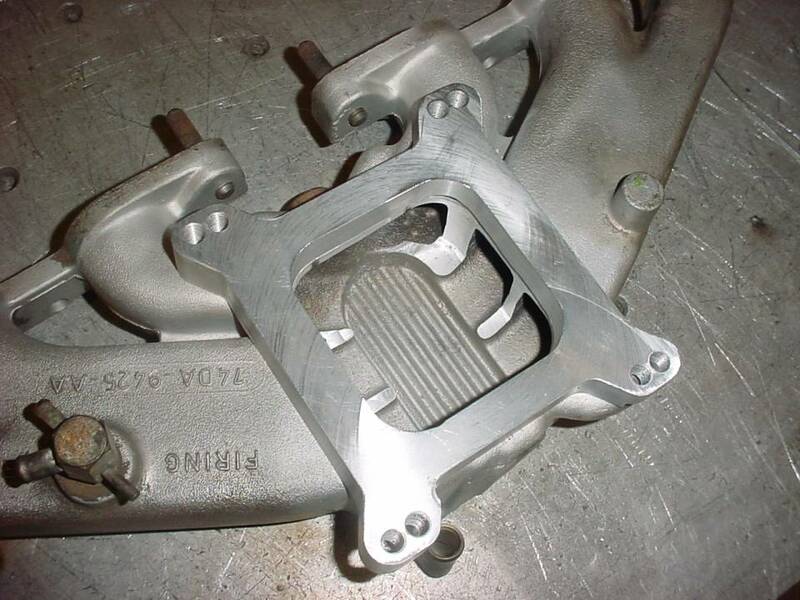 The Summit carb is okay, it has Autolite 4100 parts in it, and none of the casting problems and built down to a price plastic that the ill fated Holley 4010/4011 had. Ones that aren't bad carbs, but don't work well out of the junkyard or box are the IMCO and Thermactor era 4-bbl Autolite 4300, Motorcraft 4350, and Carter Themoquad 9600/9800s. The brand new Edlebrock 1405/1406, Carter AFB, Carter AVS, same. They can work , but you have to do some rejetting with different metering rods, reduced fuel pressure and some adaptors don't fit. These carbs all have shot gun float bowls, so they are wider and don't pacakge very well in a detachable 2V or 4V intake. They can work, just that they need a lot of space and time to unlock there latent potential. To a lessor extent, the the 4180C Holleys and Rochester Quadrajets. With the right vacuum line settings, the 4180C can work well. The Rochester requires a very large intake manifold adptor change, and its hard to package, like the 4300/4350/TQ/EB 1405/1406'S. then your best option is the Two Weber 32/36 DGAV or 38 DGES....Ford US and Europe has used each of these carbs on Cologne and Essex 60 degree V6's in the 109 to 160 hp range. The old Autolite 2100 or Motorcraft 2150, almost as good. Jets, power valves and idle rods and linkages, 100% good quality parts, an If the Autolite/Motorcraft K cluster has cracked well tubes, you'll need to fix them, but its found on all low power 221/255/260/289/302/351/352/360/390/400 V8's, and AMC 258 sixes/AMC 304 V8'S, and can be leaned up or down, and it works with EGR, cold start chokes, and all that seamingly complicated emissions crud is actually easy to find and to integrate. then you need to be aware that the air fuel distribution and space limitations will require you to cut the spring tower brackets, and you will have to spend a lot more if its automatic to have a good downshift lever or cable. The coarser atomised fuel droplets of the Holley 4-bbl will give great power, and 390, 465, 470, 570, 600, 650, vacuum secondary or mechanical secondary, its all able to work from a little 8.5:1 compression 390 Vac sec making 135 hp like kstangs did, or to over 200 hp with 11:1 compression, a big Clay Smith Cam, an 480 Autolite 4100 or 600cfm 4-bbl Holley like some other 2V style headed engines have. Your seriously not going to rework a 2V intake. The item on the left is an M code 170 HP 250 2V intake set up for a Holley 350 cfm 2bbl, but Matt Cox sells a good Weber 38DGES and an adaptor to suit the Weber is the same as the uni fit Rochester 2 jet to Weber. On the right, is the rare 164 HP 221 SP intake for the Argentine head. Basically, the world over, the Ford Six has been experimented with and modified. Just Do it! 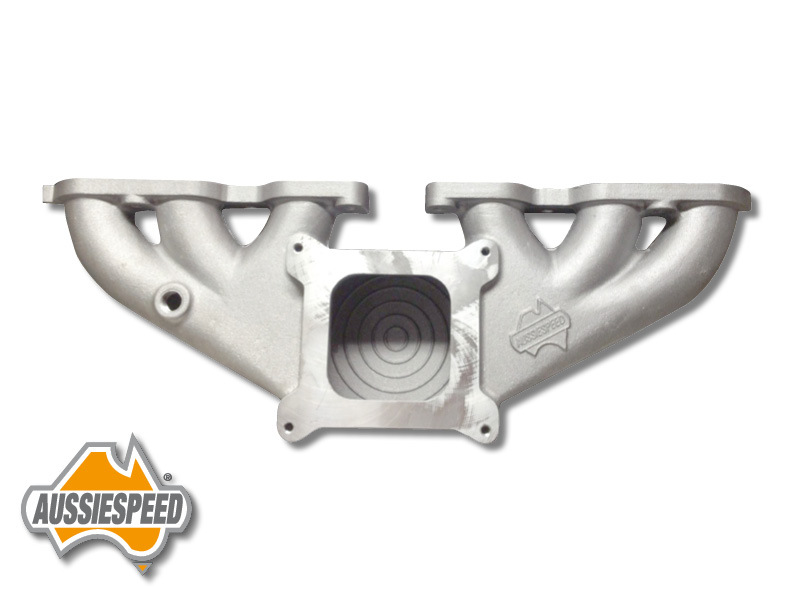 Take the left bow, do the first steps, and later on, look at a better intake. The European 2.5/2.8/3.0 V6's ran wonderfully with just a 38 DGES type Weber, a match for the 1.14 Motorcraft, both normally about 300 cfm, and able to make 135 to 140 hp with 165 to 175 lb-ft in those little sizes. Adding the 50% extra capacity of a 200 or 250 to it, and you'll race up to 185 hp and 225 lb-ft fairly easily. Past that it pays to look at the 500 cfm Holley (a 1.38 venturi carb), or the Motorcraft 1.21/1.23/Autolite 1.33. Last edited by xctasy on Wed Jun 21, 2017 1:10 am, edited 3 times in total. Ok, so what I get out of that is that it's probably best to go with the 38 DG?S series (probably E so that I can make my own life easier and ditch the manual choke). Also, what about mounting it? Will it bolt straight up? What about the rod linkage? Any way I can keep that in place and still use it? madmaxmarchhare wrote: Thank you for that information! Not really, everythings so inter-related. I like Keith from Tennessee's post on http://tercel4wd.com/forums/viewtopic.php?f=7&t=2256. The Redline K740 adaptor, with the old 4AC Tercyl throttle looks perfect. With a cable throttle, it'll work fine. The 38 and 32/36 has a standard Pinto/ Capri linkage which is easy to get hold of, and they have a kickdown lever if you are going C4 automtic. There is also a 4bbl adaptor plate, but its quite tall. I'm currently ready to swap my Stromberg out with a more capable carb. Additionally, I'm a newbie to all of this, so this will be a learning experience for me. I'm slowly upgrading my engine, as I learn about each part, and right now, it's the carburetor. Does anyone have any suggestions for having a stronger carb that will adjust to my engine as I replace parts such as the head to a 2V, cams, etc. etc.? I'm happy to go with rebuilt, as long it's something I can still get parts for with relative ease. Matt Cox has over 200 parts on offer. The 2V is a little bit different becausethere is no Ford Weber kit for it in the US or Australia. Going 2300 2-BBL Holley often means you can't use the right parts to get the carb low enough, and its not an emissions carb, and doesn't take some of the good tuning stuff that a Weber 38 can. In any avent the linkage would be a little more effort with a Holley due to the throttle lever hitting the base of the intake manifold. Adding a spacer just pushes the carb up quite high. 258 cid 4.0 ltr, 4.2 ltr ALL w/ 2bl Carter BBD, which is the Stromberg WW2 carb base. Some Jeep guys might have just the adaptor kit. 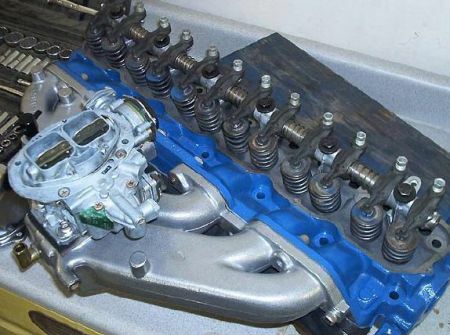 The Carter BBD is a really excellent carb, but its not friendly in your 2v 250, it has linkage and metering rod and set up issues which requires some time and effort. The Weber 38 DGES is a fit and forget proposition if you use the right parts. Its big enough for 185 hp, and as long as the fuel pressure is wound down, and due car is given to the float level and PCV requirments, its the right carb for power and economy. It will require the odd idle jet clean out, and that's the only negative to it. The linkages and all the other stuff, easy peasey. 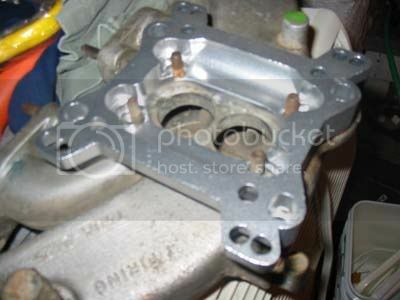 The carb is short, and it takes two carb to manifold base adaptors to fit it. What works for a 250 2V is what works for a 258 2-bbl Weber 38 Jeep. Best air cleaner is the SKU: FSP-200-OAC oval air cleaner which takes the SKU: SPE-200-OFC Oval Air Cleaner Replacement Filter-Cotton. To fit it, use the SKU: WEB-DGV-ACB weber to Holley 2v/4v base, and you should have just enough room. Igntion, go Duraspark II, and set it up like the Jeep guys do, but use the bigger Ford distributor cap. Matt Cox's DUI's can work, but you'll need it recurved. He suuplies a Dursapark kit too. The key thing is this is what suppliers have given Matt a great, sharp price for. There are issues compared to other ignitions, not everyone aggrees on the best options. We call it Ford Six Performance, but its often just Ford Six Replacements, lol. wsa111 would be your best option on a suitable ignition. For setting up a Weber 38 DGES, the Jeep guys are the best advice. The 258 uses a 2V 250 STYLE CARB, a Ford Duraspark II ignition that has a cap that cross fires, but they have the best return line fuel filters, and the best advice around, and John Strenk AND SWATSON454 do it all. http://www.jeepforum.com/forum/f8/weber ... ndex1.html , but its a 12 pager. You'd be okay with US valves of the 1.65/1.48 size with the US valve guide size to avoid costs and problems. Ok.. this is all making sense. I can certainly go stock on the intake and exhaust and go with the 38/38 kit. I'll have to read more carefully about the linkage since my brain is in "rest mode" and can't wrap itself around everything that was there..
xctasy wrote: Your not this "madmaxmarchhare"? 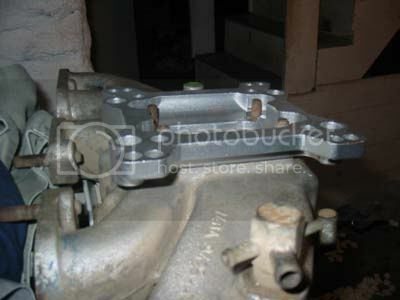 Mustangaroo wrote: Go to the bone yard and locate a 1978 or later fairmont throttle cable linkage, including the pedal! if you still have the log head it will work just fine, if you have a aussie 2v head it will be about 7 inches short, and then you will have to replace the cable and make it longer to fit the length you need! If you're already doing a performance valve job, then by all means go with the 1.75" intakes. The three angle valve job will make the biggest difference over the factory one angle seat and valve cut. Next in value would be to smooth the transitions from milled to cast surfaces in the valve pocket. Then, a 4th back cut angle on the port side of the intake valves. And then spend some time smoothing and polishing the chamber. For your purposes, a 1.75" intake and a 1.38" exhaust is pretty good. This exhaust is 78% of the intake size, which is pretty good. Any larger size valves in an engine with a bore this small would see marginal returns and mainly at higher rpms and at highest lifts. With the 3.68" to 3.72" bore it is very difficult to realistically (in terms of money and value in return) get bigger than 1.75" intake and 1.5" exhaust. For street and general use, we don't back cut the exhaust and leave the margin a little wider, at .100", to help with heat transfer to the head. We've used 144 1.467" intake valves as exhaust valves with good results, so far.We have shunned 1.5" chevy valves because of the extra machining required to get them to fit, and because of the small bore and inherent shrouding. Milling will help to unshroud, by dropping the valve a little deeper into the cylinder. Cutting the head to accomodate a 1.75" intake is not a big deal and should not cost an additional $100. Anlushac11- I'd sure like to know a source for a 1.75" small stem Stainless Steel valve to fit our sixes? Please let me know where to find it? I had heard that Clifford was getting stainless steel intake and exhaust in 1.88" and 1.50" from SSI, but have had no luck in finding since Eric parted with Clifford. If we could source these valves direct from SSI it may be a feesible option. The biggest limitations in larger valve size is due to the small 3.68" bore. In unsrhouding, be sure to not exceed the bore of the cylinder or you wil have gaset sealing problems. If the $250 total includes the 3 angle, milling and cutting and installing larger 1.75" intakes and back cutting the port side, that's not too bad. Are you going to have a port divider welded in? Now is the best time to do it. Your '67 head will likley be the smaller 52 cc chambers so measure and plan carefully before you mill, to achieve your goal CR. Go to the US valve guide sizes. 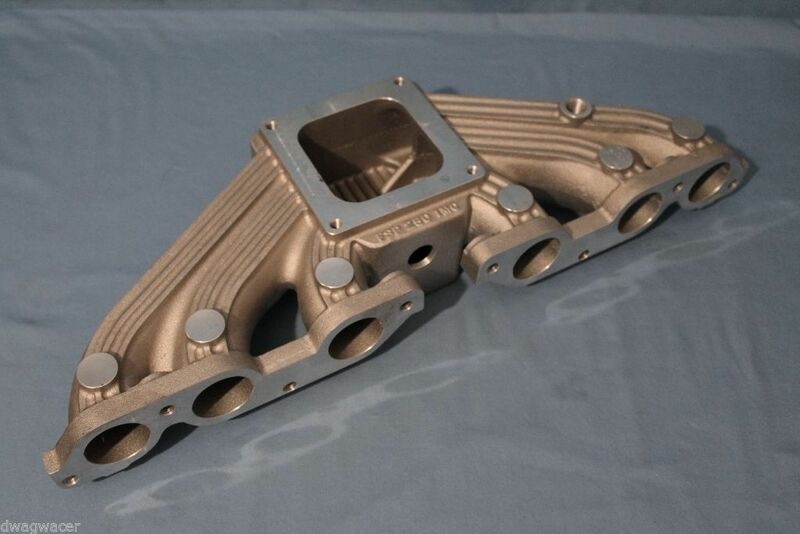 Go US 1,75" SI intake if they will machine the valve pockets for a small fee. Old 144 1.467" intake valves are very high quality steel, and your best option if you can find them. That gives you a margin for protecting your investment. Going to 1.5" exhaust valves is a very bad idea, but people get away with it. Jimbo65, discontinued user with a GT replica 1965 Stang with 2V 250 head, found out about the first cylinder having insufficent metal for a 1.5" exhaust valve. His engine builder sonar rayed the pocket and found the issue. Its a typical 2V 250 head issue. US heads have more metal in that intake and exhaust pocket and seat area, less everywhere else. Jimbo 65 had a 130 amp alternator, and a fully rebuilt rope seal 200, and problems with making his 350 cfm 2v headed 200 idle due to the alternator and rope seal load on the engine at idle. But it was an epic car. Because he's a professional video editor, his time was precious, so he opted out of FordSix.Com, but his rebuild was very well done. Or it will be once it is on the road again, soooon. But honestly, I know I will never get what I put in back, but I don't plan to sell anytime soon.... my scars must either fade or be removed first. I am never complaining when I state that I spent more on the six than I would have a Cheapo V8, I LOVE THAT. Honestly, it's entirely up to you, but I say find a V8 car and start there, at least honor the six that is was. I got everything off a 78 Fairmont..
Then I trimmed the pedal bracket about 3/4" because it was too long..
mounted that, ran the cable through the firewall and to the engine bracket(which also holds some other lines nicely...) and to the carb. Worked great for under $40.00 for everything. strat1960s wrote: Way back when, probably almost 9 years ago, when I went with the Oz head and Weber 38DGAS carb, I ran the Lokar throttle and kickdown cables and pedal. Frankenstang: 65 Mustang, 68 200 I6 block, Oz head, port/polish/spin balance, FSP roller rockers, DUI dizzy, Clifford dual headers w/ port divider, Isky 262 cam, Weber 38 DGAS 2bbl Carb, Lokar throttle and kick down cable conversion, A/R 4-lug Outlaw II rims, Painless harness. I always have fun. Sometimes are more fun than others. Welcome to our group. Here is a list of the components I have put into my inline 6. In addition to these components, I had the motor rebuilt to include the port and polish and spin balancing. I hope this helps give you a few ideas. I couldn't find the information on it, but I am also running the roller rockers that AZ coujpe sells. Good luck with the build up, I look forward to reading about it. 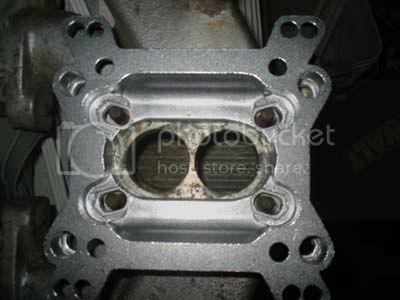 xctasy wrote: Go US 1,75" SI intake if they will machine the valve pockets for a small fee. If I give this guy these specs, can he get or machine the valves, himself? Also, what about the springs? Would the head bolt kit for either a 200 US or 250 US fit the OZ head? What about the head gasket, itself? Go to the US valve guide sizes. They are 0.3125"
IIRC right, I think the US market Sunbeam Alpine or Hillman Cricket valve guides are the same external diameter in the head, then same 5/16 0.3125" diameter at the valve. You don't have to follow the larger valve guides the 2V 250 used, the US 170/200/250 used tiny 5/16" 0.3125 stem valves in the 20 odd years it was produced. Ford Australia just decided to use the bigger valve diameter because suppliers offered them a good rate, and it standardised the largrer guides and allowed them to downgrade the valve material. Going to 0.315 allows any US valve size. SI make 1.75" in the 0.3125" stem size. The OEM 144 intake valve is 0.3125" stem, and really good as an exhaust valve. Stock US bolt kit fits the OZ head. A 60 thou planed head with a Victor Reinz US 200/250 gasket will work fine too. Last edited by xctasy on Mon Jun 26, 2017 12:41 am, edited 1 time in total. Wait a moment...... Is your ride still '73 Australian Ford Falcon XA with Right Hand Drive? Depending on the type, depends on the issues. The Australian Falcon system is simplicity itself to organise, especially if still RHD. or 3 on the tree manual? PM some pictures if you are able, not hard for XA's. xctasy wrote: Wait a moment...... Is your ride still '73 Australian Ford Falcon XA with Right Hand Drive? It is a '73 XA, yes, and I'd totally love some help! It's three-on-the-tree manual, although I'd love to change it to a 5-speed on the floor... either way, the latter wish isn't going to happen right now..